After last week’s juggernaut here’s something much smaller and more manageable: a 4×2 straight truck with a low day cab, typically used for short distance trips. 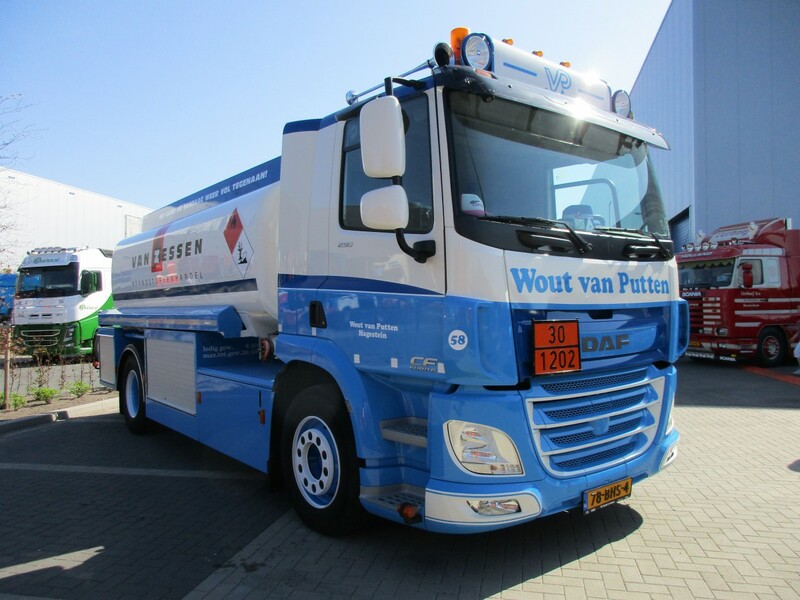 This ultra-clean and tidy tanker truck delivers diesel fuel to farmers, agricultural contractors and building contractors. With its set-back front axle (standard on all Euro-trucks, regardless the segment) and short wheelbase it’s highly maneuverable. 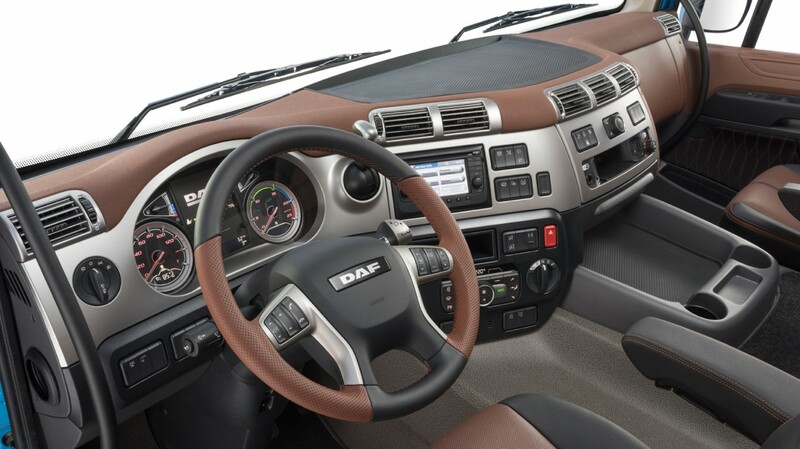 The CF is DAF’s mid-size model, positioned right inbetween the lighter LF-series and the XF top guns. 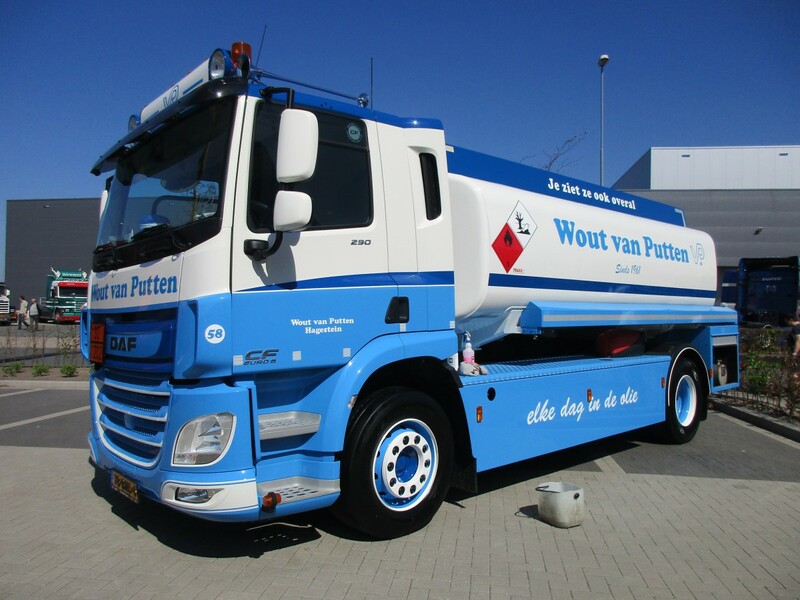 Van Putten’s shiny happy CF is powered by a 10.8 liter inline-6 engine, known as the Paccar MX-11, with a maximum power output of 290 hp. That’s more than adequate for a truck with a legal maximum GVM of 20.5 metric tons (45,195 lbs). Besides DAF, all other European truck makers (Scania, Volvo, Mercedes-Benz, MAN, Iveco and Renault) also offer a full range of trucks and tractor units, leaving no noticeable market share to “outsiders”. Light trucks from Nissan, Isuzu and Fuso are available, but in Northwestern Europe they’re all as rare as hen’s teeth. The orange plate on the front and back of the truck tells what’s inside the big tank, it’s legally required on all vehicles transporting dangerous goods. In this case: 3 for a flammable or combustible liquid or gas; 0 for no additional danger; 1202 for diesel or a comparable fuel, like home heating oil. If you see a tanker truck in Europe with the number 33-1203 then it’s hauling gasoline. That’s a double 3 for highly flammable, 1203 for gasoline. And this here is the interior of the current CF-series, more specifically the high-end Exclusive Line trim level. Now I don’t know about you, but personally I would prefer this to many modern car interiors. 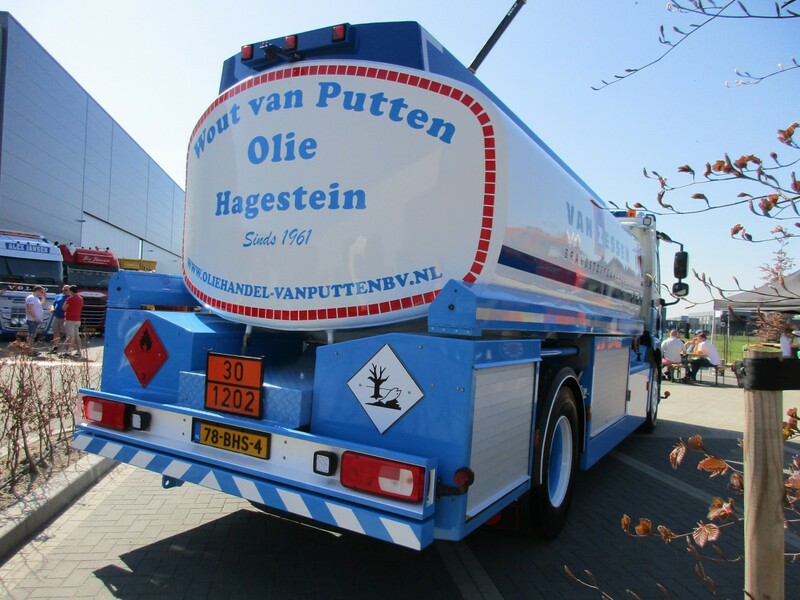 “Elke dag in de olie” means the truck’s owner is in the oil (business) every day. On the other hand, “in de olie zijn” (being in the oil) is also a Dutch expression for being drunk. Thanks Johannes. Nothing like translating things via computer versus how words/phrases are left unstated or incomplete by actual people. Here in the US we might say that someone is “well lubricated” when they’re drunk, too. great explanation of the truck and its contents. Am I rigt in thinking this truck may have been built by Leyland in England, as part of DAF? Not likely. Since last month DAF builds 250 units per day in Europe (and that’s an all-time record): 212 in the Netherlands, 38 in the UK. The CF in this article is a direct descendant of the 1992 DAF 65-75-85 series. Doesn’t Leyland mostly make LFs? I think technically Leyland isn’t part of DAF. It’s owned by PACCAR and the trucks it builds are badged as DAFs. Edited to say that Leyland not only builds but designed the LF – and all two axle rigid CFs (according to Wikipedia) so Roger might be right. Might. Edited again to say I don’t think I’ve ever seen a 4×2 tanker before. Thanks to its 9 tons front axle (which also means super singles) the 4×2 chassis has a very decent 20,500 kg GVM; 9,000 kg on the front axle – 11,500 kg on the rear axle. Decent trucks, genuinely hard to fault…although the engine hump is a bit intrusive if it’s a sleeper cab. I’ve driven them since the original DAF 85 right up to the modern CF. better seats than a Scania too, at least in the fleet versions. It’s not a sleeper cab. I’d say the only reason the cab is as it is, is because it goes back as far as the back of the engine. The dangerous goods placard showing the UN numbers is the same all over the world. Ok I stand corrected – do you have to tip the seatbacks forward to fold it down? I’m familiar with DG placards but I can’t recall seeing the marine envirionment hazard one before, arguably superfluous when you have a flammable liquid one? The CF in the article has a day cab. Below a CF with a sleeper cab. It’s also available with a high roof, like the big XF. If you like Euro trucks, check out NatGeo’s “Ice Road Rescue,” the European counterpart of Canada’s “Highway Through Hell.” It depicts many trucks like this braving Norwegian winter conditions; DAFs, Volvos, Scanias, and MBs are common. I worked for Paccar in the US from 1977 to 1982. I was very aware of the Foden acquisition and was even on a short list to travel to the U.K. as part of the transition, though I never did go and moved to a completely different industry in ‘82. I totally lost track of the truck industry until I retired in 2012 and decided to catch up after 30 years. I was very surprised to learn that Paccar, once so firmly a US west coast company (albeit with fingers later reaching into Australia, the Philippines and Canada), had become multi-national and further acquired storied names like Leyland and DAF. And over the last few years, thanks to CC, I’ve learned a lot about modern DAFs in particular. As was my somewhat educated perspective 30 years ago, European trucks still seem far more sophisticated than their US counterparts. A Kenworth K200 uses the same chassis and powertrain as the six or eight wheeler DAFs but all the comfort is dialed out, why I cannot tell you but talking with a K200 driver last week he had the same moans about lack of comfort that has hallmarked American trucks for decades, You guys must have really smooth roads, we havent. I’ve said it before, in hindsight the 1996 Paccar-DAF deal was a match made in heaven. 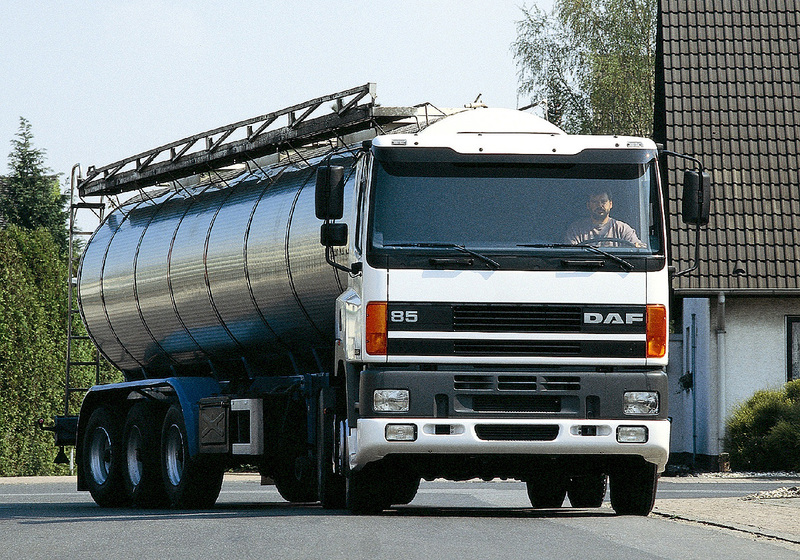 DAF was too small to survive on its own in today’s global market, and Paccar gained access to the important European market (something that never would have happened with Foden alone) and to DAF’s diesel technology (Paccar never made their own powertrain components). And now they’re a successful global player with production facilities all over the world.